Click addiction : To take pictures when nothing of interest happens. 2) You usually take 15 pictures of each scene, and hope the decisive moment is somewhere in the burst. 3) Your girlfriend has just dumped you. She got tired of you checking out that beautiful Japanese girl in her back, a so called "Bokeh". Evolution cannot be stopped. Our kids will have L shaped index fingers. 4) You start shooting people "walking", "sitting", or "lost in their thoughts". And dogs too. 6) You just returned from a shoot in downtown Peoria, Illinois, with 1698 pictures. 7) You take you camera to the toilets, and practice focus technique on the paper rolls. Shooting books is usually a symptom of click addiction. Yet, in this case, the subject is safe since the book is not located on a shelf at home. 8) You buy 1 Tetra-bytes external drives every month. 10) The next morning, you frantically click on your alarm clock's snooze button, and expect a picture to appear on the LED screen. Damn, I thought I was the only one to do this… So true… And scary if other people also do this !! Now, about Peoria, have you ever been there? Ever heard of „Will it play in Peoria?“ – you'd be surprised how much it has to offer! 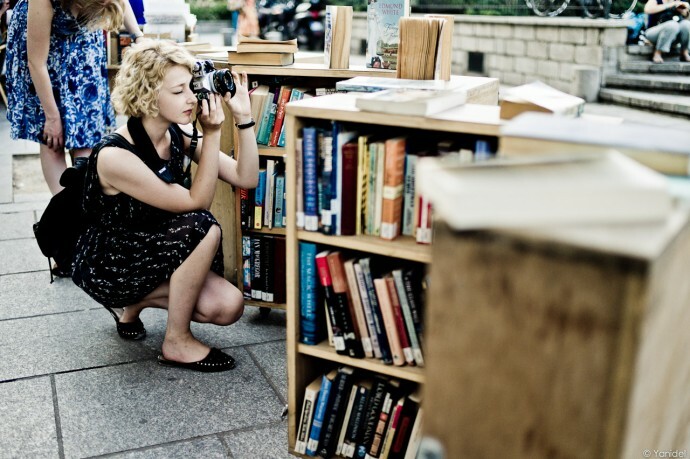 The girl shooting books is using a Canon AE-1 Program…she's shooting film! LOL …. you are perfectly right, but it could also be "Go across the Pont des Arts" every time you go for a shoot in Paris. i am being stalked by Yanick Yanidel..how else do you know all this..how? i should look over my shoulder more.. aw look at that.. no that, there, got it! darn batteries going! Quick re-load. ah! more to do..
what else is there to do, read facebook? Duh. I thought this was list was hilarious because I live about an hour away from Peoria. There isn't as much to photograph as St Louis or Chicago but it's a pretty cool little city. They have an excellent (but small) Zoo and a nice river front. I have been there once, used to work for the big company in town ;) But wasn’t too impressed to be sincere, except for the seafood place by the River. Cheers.